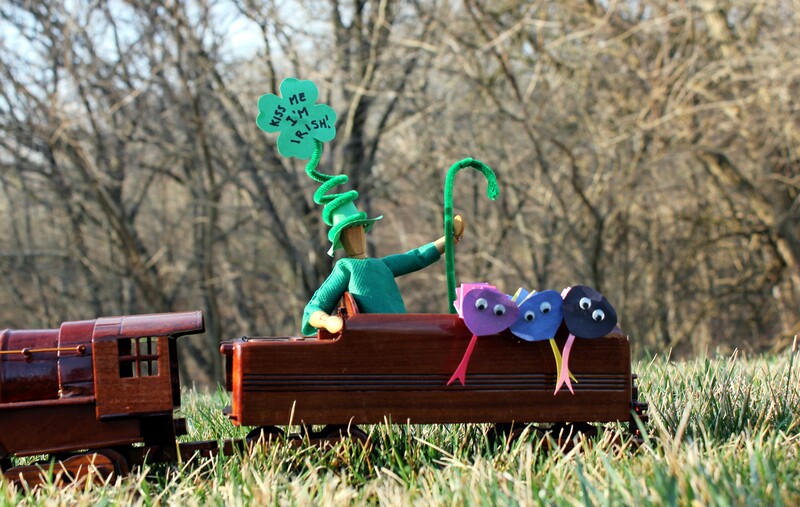 Dummy decided to drive some snakes around in honor of St. Patrick. I wouldn’t let him borrow my car so he had to take the train. His friends are Choral snakes. Choral snakes unlike coral snakes are nonvenomous. As you can see they have round pupils as opposed to slitted ones. If you see a snake with slitted eyes stay away even if they try to lull you with a song. The Choral snakes are named Finbar, Ronan and John (their mother is a big fan of the Irish Tenors). This is the song they sang for Dummy, it was quite lovely if a bit lispy. The theme for WordPress’s weekly photo challenge is “unusual”. I thought I would enter Dummy’s pic into it. Let’s just keep that between ourselves though, I don’t want him getting a big head. Thanks to all who have expressed their concern about my eyes. They’re still a little sore but much much better then they were. I’ll be back to painting soon! < Previous Et tu Monkey? Oh Virginia boy, Oh Virginia boy you’re a wacky soul. You should say “Kiss me I’m half Scottish and British.” Happy St Patrick’s Day to you too. 😀 I can’t help being wacky, it’s genetic. Thank you and your comment just made mine! Yes, yes, there is a Virginia – like no other! Even reading a day late is a special treat! Your pictures and paintings are beautiful! You must be very creative! Thank you for being the first person to comment on my blog! 🙂 Your dog is too cute. Did you see the pictures of my dog and cat? They are best buds! Its under 5 ways to make your dog and cat happy. I have a miniture poodle that looks like a little teddy bear. Thank you for popping in at my blog, enjoyed reading some of your posts.